Client Success Story: Below is what Bailey’s owners had to say about in home dog training Westchester NY. 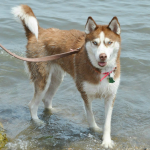 “Bailey is a one and half year old Siberian Husky. Her breed is notorious for intelligence and stubborn behavior. Bailey always had a mouthing issue, but it gradually became worse. Once Bailey was put on anti-seizure medicine to help control her seizures, the mouthing became unbearable. She mouthed for everything such as boredom, needing to go out, bed time, etc. In addition to her mouthing, Bailey had no recall whatsoever. My husband and I would call her to come in from outside and she would stare at us with this face that said “yea, okay” and eventually trot away or lay in the grass. Regardless of your dog’s breed, age, size or behavior challenge, there is not need for you to continue to struggle. My S.R. Dog Training in home dog training in Westchester NY program has helped hundreds of dog owners, and I can help you. 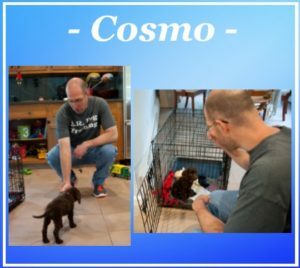 Cosmo’s family are very smart and proactive owners, as they wanted to start proper puppy training within 48 hours of his arrival from Seattle, Washington. Early puppy training is the greatest determining factor in raising a well-behaved dog. A common for puppy owners, is the fact that their dog will not respond to their name. That’s why one of the first things we did was teach Cosmo his name (as seen in the above pictures). This teaches him to look and make eye contact with his owners, every time they call his name. Attention and focus are the first steps to teaching your dog reliable obedience. You cannot expect your dog to “Come” when you call and listen around high distractions, if you can’t at least get their attention. 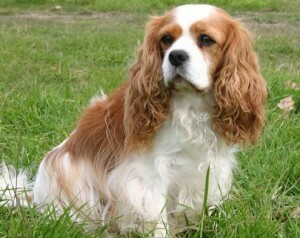 Woodie is a 9.5 month old King Charles Cavalier, who was recently rescued from undesirable living conditions. Woodie’s owner was struggling with several issues, so she contact me for Home Dog Training Westchester NY. Apparently Woodie was never properly housebroken, as he was having frequent accidents in the home. We immediately addressed this by troubleshooting why the accidents were occurring, what an appropriate schedule is for him and solving his crate training fears. Woodie was Harry Houdini in Canine form. His owner would put him in his crate, secured the latches with wire ties, but he still managed to escape. Proper crate training is important for most dogs, but essential for him, as his owner will be traveling a lot and he needs to travel in a carrier. Instead of trying to find securer ways of trapping him in the crate, we are properly and positively conditioning him to the crate. This will cause him to look at the crate as an enjoyable and safe place to rest. 4. His owner will put him in the crate for short intervals throughout the day (about 5-10mins at a time), not only when she leaves the home. This is very important, as most owners only put their dog in the crate when they leave. This makes for a negative association in the dog’s mind. If you do short sessions when you are still home, the dog does not automatically associate the crate with you leaving and being left alone. Those are just a few of the actionable steps Woodie’s owner will be taking in order to properly and positively crate train him. Woodie’s owner was very proactive in beginning Home Dog Training in Westchester NY within days of rescuing him. Regardless of how long you have been struggling with your dog’s unwanted behaviors, we can solve them.